I See What You Did There! Or Do I..? Posted on April 19, 2012 April 19, 2012 Categories funny, really? The Chron had a little write-up on “the Village, a Thomas Kinkade Community” – a subdivision of shoddily-constructed McMansions modeled after the Painter of Light’s™ favored subject matter (I KNOW!). In other words, fake Tudors, ersatz Victorians, faux French Provincial, etc. So charming! I’ve read and re-read the last sentence of the following paragraph over and over again. And I remain completely unable to determine if it is simply an example of a writer who is unfamiliar with the actual definition of a particular word she uses – or whether it is a subtle and ingenious dig at both the deceased and those who collect his works and live in this “village”. 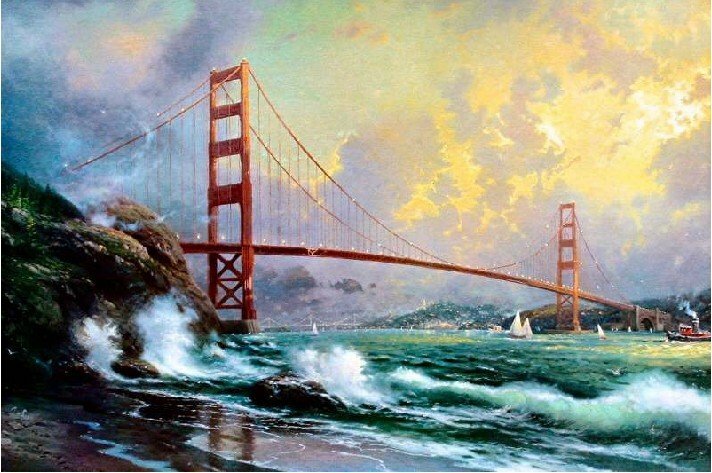 Sales of Kinkade’s paintings and reproductions have gone through the roof since the artist, who lived near Los Gatos, died April 6 at age 54. That’s typical after an artist dies; fans and speculators bet that prices will rise because no more originals can be produced. Whether that holds true in Kinkade’s case is debatable because of the sheer enormity of works produced during his lifetime. Considering it’s the Chron, though, I’m inclined to believe that she thinks “enormity” is a synonym for “very large amount.” But for all intensive purposes, this really just makes the whole thing even better… I literally died laughing.